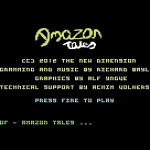 Amazon Tales was to be something a little different from two game creators – Richard Bayliss and Alf Yngve. Richard was firstly doing a side ways scrolling game with a running man as a main character. Alf on the other hand was branching away from SEUCK on the C64 for the first time. The 16kb cartridge competition ran by RGCD was coming up, and Richard decided to write a new game based on Jungle Story (and building on the Bionic Granny Returns game). As time went on, the idea blossomed into a completely different type of game where you play the vet from a tribe who accidentally has released an elephant from its pen into the jungle. You have to go and find it and bring it back to safety. 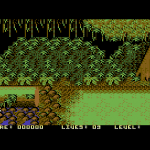 The game was a sideways scrolling game, and Alf produced all the graphics in SEUCK – which Richard later ported over to Charpad and into a completely new engine coded by Richard. The graphics produced were fantastic as usual by Alf. However, sadly the game still very much felt like a SEUCK game that had been enhanced due to not quite getting to the stage of completion as planned, and as a result the game didn’t score greatly at the competition. It had some problems unfortunately with a few compilation problems, but Richard just about managed to get it submitted in time. After the competition and at a 75% complete state – Richard was due to go back to the game and add features such as falling boulders, monkeys dropping coconuts and adding in collectible objects. Free time was limited though, and mixed in with a dipping motivation or enthusiasm for the game, Richard decided to call it a day on the game. Richard has kindly passed on all the remaining resources on the game for us to add. It is pretty much a final version and completable, but we have still listed it as a preview, as there was certainly more to come for the game over time. Check it out and see what could have been! “In 2012 the RGCD 16KB cartridge competition was launched, and I wanted to write a new game for the competition. I wanted to try something different, and based on Jungle Story and show how the game should have been made if it was written today. The success of Bionik Granny Returns had me eagre to try something out of a Jungle Story game. Fortunately, it turned into a different game. You played a vet from a tribe, who accidentally released an elephant from the pen, and into the jungle. The tribe isn’t happy with you, so you get sent in search of it. So that you can take it back to safety. The stunning graphics were created by Alf Yngve using the Sideways Scrolling Shoot Em Up Construction Kit. The graphics got exported from SEUCK into Char Pad and then extracted into the game’s source code. The scrolling routine was the biggest pain in the backside, because of the colour block flickering. With thanks to Achim Volkers’ support, this problem eventually got fixed. Although the game was literally finished, I had to rush hard to get an entry for the competition. The deadline was looming with this project, therefore at the end – the game was 75% finished. Even at that percentage there was a problem. RGCD could not get the game to work. Luckily on deadline day, I managed to get the .crt fixed and submitted into the compo.